I do not know about you guys, but I crave Downton Abbey something fierce when it’s not on TV, especially when I need to relax. I love watching the upstairs and downstairs refinement and the microcosms of Great Houses.�Manor Of Secrets by Katherine Longshore is quite the departure from her previous Tudor-based fiction. Longshore rises to the challenge of breaking her mold quite admirably. 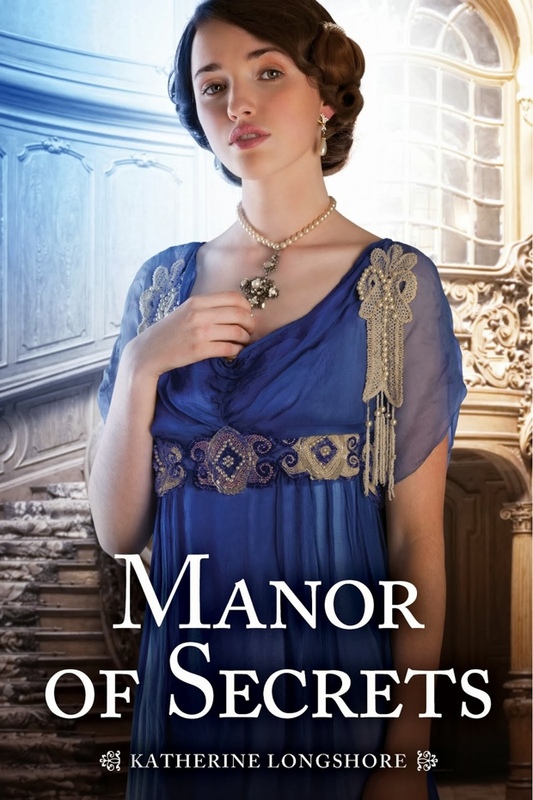 Friends, I am ALL about�Manor Of Secrets, especially because it’s like my BBs Sybil and Mary are on the cover and you know, I am a shallow person like that. Overall,�Manor Of Secrets is a quick and engaging historical fiction about the intersection between Upstairs and Downstairs, also romance and girl power. Katherine Longshore’s�Manor Of Secrets takes place in exactly the same era as�Downton Abbey.�It opens with Charlotte, one of the ladies of the house, contemplating her lack of freedom and options — kind of reminded me of that part in Titanic where Rose is about to jump and Jack stops her. Charlotte is different from the aristocracy in that she enjoys writing fiction and fiction was looked down upon as an occupation, especially the romantic, adventurous sort that Charlotte is writing. So anyways, Charlotte is at a party and her mom is all, here date this guy because he will become a duke and Charlotte is like BUT MOM HE IS BORING HE TALKS ABOUT WEATHER, so she decides ahhh what the heck, why don’t I follow this maid, Jenny, I think her name is and see what adventures she is up to. Charlotte dips her toes into some muddy water, finds out the maid’s name is actually Janie AND manages to piss her BFF Fran off. So, she sneaks back into the house so she doesn’t piss her mom off and comes across a super hot footman named Lawrence. FYI Lawrence is tall and has pretty eyes. IT IS LOVE. Well, not quite. So, anyways to make a long story short (too late!) Charlotte begins a friendship with Janie, who is a kitchen maid. OH OH and Charlotte’s unorthodox aunt is visiting which totally stirs things up. FYI you guys, the story alternates between Charlotte and Janie. Janie is desperate to keep her job, now that she’s working back in the house with her mother. Unfortunately, a series of mishaps keeps getting her into trouble. Will she stay or will she go? Read�Manor Of Secrets and obviously you will find out the answer to this question. Charlotte is kind of a wet blanket at first glance. I mean, she does not have Lady Mary’s rigid spine nor does she have Sybil’s feminist mettle. She’s clearly not similar to the Crowley sisters at all. Well, except that she wants to tussle with the help HEYOOOOO. Anyways. After I got to know Charlotte, I stopped thinking she was such a drip. It just turns out that she has been living her life to please a mother, named Lady Diane, who is a total jerk and in desperate need of affection and acceptance. She’s also braver than one would expect. I actually really liked Charlotte’s creativity and the arc her character undergoes. She’s someone whom you root for to get a happy ending. ALSO, the big secret concerning Charlotte. I liked that. She really is kind of like Rose in Titanic, living in a gilded cage and Longshore rocks at portraying this. Janie is the kitchen maid and she’s portrayed as fearless at first. You learn she broke her collarbone on a dare while jumping from this thing called a “ha-ha”. I don’t know what that is and I am too lazy to look it up. However, when we get to it, Janie is actually not fearless, she’s scared of a lot. She does not want to lose her job because she’s finally in a place where she gets meals on the regular. She loves what she does which is cooking and she does not aspire to more. She’s a quick thinker, helping Charlotte to get out of some pretty intense situations. I liked that she didn’t take Fran’s rudeness lying down. (FYI, Fran is the utter worst). I quite liked how Janie knew what she wanted in life and was pretty content with what she was doing. I also loved that she was a good friend, taking the fall several times when what happened was not her fault. Basically, she is great and you will see that too when you read�Manor of Secrets. If you remember how Longshore did tension in�Gilt and�Tarnish, chances are you are chomping at the bit to hear about the romance in�Manor Of Secrets. Friends, she dials the sexytimes down quite a few notches in this book. I think that her latest book skews a bit younger as far as romance and sexual explicitness goes — meaning that there is not really any sexual explicitness at all. Barely even some kisses. But boy howdy those kiss scenes, YES. The romances are of the slow burn I didn’t know I liked you all along variety, but you will read and be like, yes this makes perfect sense and these two characters really do belong together, they are meant to be. I have to state, I liked Janie’s love interest, the servant Harry better than Charlotte’s two love interests – Lawrence and the Duke whose name I am blanking on because I am writing this on scattered sleep. Henry and Janie just work because they challenge each other and those feelings have basically been there all along. Trust, you will think that it is perfect. As for Lawrence, he’s more like Thomas the footman, only not gay, just the worst. The Duke, whose name is Andrew — yay for getting off my chair and grabbing the book — is a rather pleasant surprise is all I will say. The setting of�Manor Of Secrets is basically a manor in England, lol the title says it all. It’s got all the drama of Downton Abbey. You guys, I had no idea that living in a great house would cause so much drama, whether it is upstairs with the aristocracy who are all concerned about society and reputation and getting married or if it is downstairs where they are concerned about moving up the ladder and keeping their jobs. It certainly is entertaining. I found the impressions Charlotte and Janie had of each other’s worlds to be quite illuminating. Charlotte finds Janie’s world to be freeing and fascinating. Janie finds Charlotte’s world to be luxurious and full of unimagined riches. I will also tell you guys that if you were expecting this book to be full of stuffy, old-timey era dialogue, you would be off the mark. While the characters talk in ways that make sense for their time period, it’s nothing where you need a dictionary to decode what they are saying. I want to end this with the disclaimer that�Manor Of Secrets is not my favorite of Katherine Longshore’s books. It doesn’t have the tension or heat that I so admired with�Gilt�and�Tarnish. The book has a very slow start. It took me about 50 pages to become fully engaged. Once I got into the swing of things as a reader, it turns out that this book goes relatively quickly. I could not stop reading about Janie and Charlotte and was constantly curious about their secrets and what would happen next. I totally stand behind the romances in this book and give them my stamp of approval, it’s just this book is rated G whereas her other books are totally PG-13. If you are into books that read similar to your favorite TV show DOWNTON ABBEY minus Carson and Branson and Mrs. O’Brien’s Bangs, then you totally need to get on reading Manor Of Secrets by Katherine Longshore while you patiently wait for the next episode to air or even the next season. I was already looking forward to this book, but your review has me even more excited about it! Aww, yay, I hope you love it! I’m a Downton fan tooo so clearlyyyyyyyyy I’m gonna need to read Manor of Secrets. Plus I loved Gilt, so I’m already a Longshore fan. Personally I’m pretty happy to hear that the romance is more of a slow burn because I’m really into that and I feel like I just don’t read about a slow smoldering kind of romance all that often. I mean, it has to be done well, but since it sounds like it is done well here, then I can get on board! I hadn’t picked up on the Mary/Sybil appearance similarity until now but that’s all I can see now! Oh my goodness, Brenna, I think you will LOVE Manor Of Secrets. It’s very well written and has that same feel as Downton. And yeah, once you see the characters you cannot unsee it. I love smoldering romances too, you should read Cruel Beauty for that feel. Ohmygosh! I am so obsessed with Downton Abbey! Do you know how hard it is to avoid looking up spoilers?! Okay, I’m sure you do since you’re a huge fan, too. I love that you made the Mary/Sybil comparison as they are by far my two favorite “upstairs people.” Well, aside from Violet, but how could you not love her – or Maggie Smith for that matter. This novel just sounds beyond perfect and is just the thing to get me through the year between each series. Just another reason to envy the British. YES. I’ve definitely tried to avoid spoilers AND FAILED because I am the type that as far as TV goes needs to know. Mary and Sybil are my favorites too. Word, Dame Maggie Smith is the best. I think you definitely need to read this with some tea as you wait for the next series! As a total fan of Downton Abbey, this is one that I’ve been wanting to read for a while, and your review definitely just bumped this one up on my to-read list. I never would have thought that living in a stuff English manor would be so DRAMATIC until I started watching Downton, and I love to read about drama, so I’m really itching to try this one out. YESSSSSS. Dude, I never thought it would be that dramatic either until I watched the show. I actually thought the show would be dumb until a blogger convinced me. Oh, doooo read this one. So I’ve been a huge fan of upstairs, downstairs stories. I don’t even watch Downton Abby. I tried, and just couldn’t get into it. I know, there has to be something wrong with me!! However, I’m kind of interested in this book. First – isn’t that cover so pretty? And second you did kind of sell it in your review. Hah, you aren’t weird and there is nothing wrong with you. Tony hates Downton Abbey and he has a lock on being normal. You should totally read Manor Of Secrets, it’s different from Downton Abbey, more concentrated on two characters as opposed to a wide cast. The politics between upstairs and downstairs are fascinating. I’m so DESPERATE for more Downton, that any book that anyone says “if you like Downton Abbey” — I’m all over it. Thanks for this great review. I’m off to find this book. I bet you’ll love this and it will fulfill that need. She really handles the different time era with the same care and expertise she does with the Tudors. It is so good. Hope you get your hands on a copy! The cover is gorgeous, I love the cobalt blue dress! It is amazing. Yeah, there’s a similar theme to Titanic with the whole gilded cage thing. It’s an awesome work of historical fiction. Hope you enjoy! I have yet to watch Downton Abbey, though many people have said I would enjoy it. I really have to get started on it! Especially because I find books like Manor of Secrets endlessly fascinating. That time period can be viewed through so many different angles, and I’m glad that this book bears witness to at least two. The characters sound great, and I can’t wait to check it out!